SEOUL -- A South Korean train crossed the world's last Cold War frontier for an 18-day joint inspection of North Korea's outdated railroads as part of a much-heralded inter-Korean project to rebuild a cross-border transport artery that would be connected with Chinese and Russian lines. Based on the results of the joint study that would end on December 17, South Korea would start rebuilding North Korean railway stations and related facilities. At an inter-Korean summit in April, the two Koreas agreed to connect cross-border railways and roads. Rebuilding a transport artery, which was severed after the Korean peninsula was split at the end of World War II, has been the centerpiece of inter-Korean cooperation. However, it depends on progress in denuclearization talks between Pyongyang and Washington. U.S. President Donald Trump has cautioned against speech violation in inter-Korean economic cooperation. 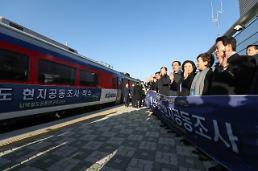 "Through the railway that would be connected into one, the two Koreas will prosper together and peace on the Korean peninsula will become solid," Unification Minister Cho Myoung-gyon said in a ceremony Friday at a station in Dorasan, just south of the border, to send off 28 South Korean officials and experts. The Koreas opened a joint industrial zone in Kaesong just north of the border in December 2004 as well as a highway and a rail track between Dorasan and Kaesong to transport cargo. The North closed its railway station in Kaesong in 2008 for political reasons. Cross-border trade and exchanges came to a complete halt in 2016 when Seoul shut down the industrial park in retaliation for the North's ballistic missile and nuclear tests. For a joint inspection, the train with six cars for passengers, sleeping, conference, equipment, fuel storage and generator carried a banner reading "Let's be one with railroad tracks from Halla to Paekdu!" Halla is the South's highest mountain on the southern resort island of Jeju, and Paekdu is the North's highest mountain which sits on the border with China. 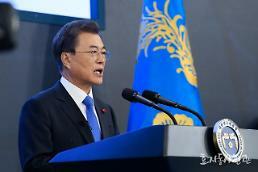 Friday's ceremony will become "a catalyst to expand the economic territory of the Korean peninsula that was trapped like an island to the continent of Eurasia," said Land, Infrastructure and Transportation Minister Kim Hyun-mee. After a North Korean locomotive took over in a station in Kaesong, the train would embark on a slow journey covering a total of 2,600 kilometers (1,610 miles) across North Korea. The train will first run up to Sinuiju, a northwestern border city which serves as North Korea's crucial trade hub and gateway. From December 8, it will move to the eastern port city of Wonsan for the inspection of a railway along the east coast up to the Rason special economic zone near the border with Russia. Talks involving the two Koreas and Russia have been held to upgrade a transport route that could be linked from South Korea to a trans-Siberian railway network. In preparation for unification, South Korea has gradually rebuilt and upgraded the southern section of disconnected railways and roads. A joint venture established by a Russian company and North Korea is responsible for upgrading a 54-kilometer-long rail line between Rason and the Russian border town of Khasan as well as related facilities. 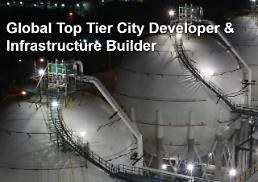 Russia and South Korea are discussing a possible pipeline project to bring natural gas through North Korea.